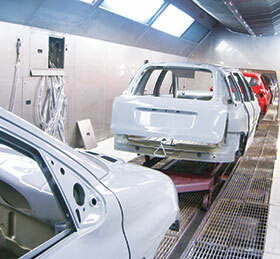 For successful paint cure, irrespective of the paint chemistry being used, it is critical to measure and control the temperature of the car body as it travels through the oven. Today, paint ovens are controlled in a sophisticated fashion via thermocouples located in each zone to give constant feedback on the ambient temperature. Although this temperature data is helpful as it gives an idea of process control from an oven perspective, it does not tell the whole story. To cure the paint to specification (cure schedule), the critical information required is the peak metal temperature and the time that peak metal temperature is maintained. The control thermocouples in the oven cannot provide this data. It has been established that oven temperature profiling is the only accurate method by which the oven process can be monitored to ensure that the paint cure schedule has been correctly achieved. The oven profiling system is designed in such a way that it is able to travel with the car body through the cure oven, measuring the product temperature continuously at selected locations on the car body. At the end of the process, the collected temperature readings create a thermal profile of the product from which the cure schedule can be measured and validated. Two of the biggest challenges of oven profiling in an automotive paint shop are the sheer scale of the operation and the time it takes to transfer equipment to and from the QA office to the paint line requiring testing. The Datapaq Oven Tracker XL2 has been developed with key features that allow sequential testing of multiple ovens without the need to download profile data between runs. The XL2 logger can be programmed to perform multiple runs (up to 10), so that each oven can be tested and its data stored separately in the memory of the data logger. Complementing the multiple run operation mode, the user can employ a unique feature called SmartPaq. Prior to the run, the user can program the logger with critical target performance criteria (maximum temperature limit, time at temperature target or acceptable Datapaq value range). The data collected by the data logger is analysed against these criteria at the end of the run and the logger indicatess whether the criteria have been achieved or not. The SmartPaq feature makes profile qualification as easy as checking for a green Pass LED, which means the user can move on to the next oven with confidence and without any need to download data. The data can be analysed in full later after all runs are completed. If the LED is red, then there has been a process problem. Knowing this as soon as possible is critical to reducing rework, since the root cause of the problem can be identified much earlier in the process. Datapaq has worked with key automotive manufacturers to develop a barrier technology that allows not just one or two ovens to be tested sequentially, but the complete paint operation from start to finish in one single run. This single pass method is used with a test car, allowing the system to be installed off line. Datapaq has even developed a special thermocouple that has high temperature magnets that ensure the sensor stays attached to the car body and also does not damage the painted surface. Also, the software can be personalised to show a picture of the car under test, along with a pictorial representation of thermocouple locations on the car.